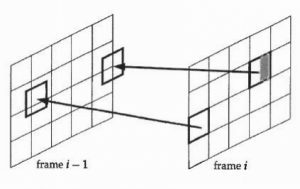 Video encoding methods save motion vector fields locally in a buffer to predict the following frames, thus reducing the size of the error pattern that is needed to decode the frames. Besides, this so-called motion-compensated prediction further reduces noise by reducing the signal-to-noise-ratio (SNR), regardless of the bit rate. Prior art is a spatial approach that reduces edge artifacts from blocking. The present method combines the spatial approach with a temporal trajectory filter to reduce noise as well as the data rate. Noise is filtered along temporal trajectories for every pixel which has two-dimensional coordinates describing the motion of pixels from frame to frame. The algorithm used here is less efficient for sources with a high quantizer, therefore an automatic shutoff is implemented for quantizers above 45. With the help of this new in-loop filtering algorithm, the picture quality could be improved considerably. This was proofed by the inventors using the H.264/AVC codec. In this way it was possible to reach a bit rate reduction up to 12 % (the average being 4 %).